TORONTO, ON--(Marketwired - December 12, 2016) - Managing receipts just got a lot easier. Sensibill has launched eReceipts, a mobile receipt management solution, through a partnership with The Bank of Nova Scotia ("Scotiabank"). The new feature allows Canadian customers to store, organize, and retrieve important paper and electronic receipts as an extension of the services offered through their mobile banking application (app) and Wallet. Scotiabank is the first Tier 1 Canadian bank to rollout the innovative new solution. The service is available to both Android and iOS users in Canada by simply updating their apps. "We believe that eReceipts is the next killer app for mobile banking. Receipts are cumbersome to deal with, but they are important to save for taxes, expense tracking, returns, warranty claims and more. We're excited to partner with Scotiabank to bring this easy-to-use, helpful service to Canadians," says Corey Gross, CEO & co-founder of Sensibill. To deliver a stable and scalable solution, Sensibill leverages IBM Cloud for a secure infrastructure to meet the requirements of partner banks. "Scotiabank came to the table early, and really helped us validate our 'bank tough' service. The solution is incredibly lightweight to plug in, but packs a big punch for Scotiabank's customers," says Gross. 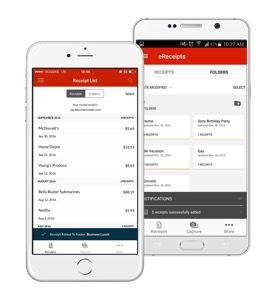 eReceipts allows customers to capture any receipt and access their purchase records directly from their banking app. Though there are other solutions in market that offer receipt capture, Sensibill is the first to enable item-level contextualization. Machine-learning extracts and structures information about each item, such as product names and SKUs. This adds clarity to otherwise vague transactions and reduces friction associated with searching for a specific purchase. Sensibill's service is also the first to offer consumers automatic matching of receipts to card transaction histories. This solution is in line with the "mobile first" trend in banking, meant to support customers' need for convenience and accessibility, as well as providing a seamless end-to-end payment experience. "Value-added services like eReceipts directly align with our commitment to provide mobile banking solutions that meet the evolving needs of our customers," says Brian McCabe, Vice President of Day to Day Banking at Scotiabank. "We have worked to enhance Scotiabank's My Mobile Wallet, which runs on Android devices, and our mobile banking app on iOS devices, as it supports our customers' entire shopping experience." Automatically or manually capture details from paper or electronic receipts including line-item details, receipt date, totals, and store information. Automatic transaction matching for painless reconciliation. Help track expenses and avoid losing important receipts by organizing them under business or personal profiles, and categorizing them by expense type. Enhance searchability by assigning hashtags, notes, and folders to receipts. Receipt text is also searchable. Export receipts as PDF documents with summaries in Excel or CSV formats for easy expense reports or tax preparation. Sensibill's Receipts iOS and Android Software Development Kits (SDKs) and APIs can be easily embedded into any banking application with flexible and configurable implementation options. For more information, please visit: www.getsensibill.com. Sensibill is a white-label Software as a Service (SaaS) platform that allows retail and small to medium sized business (SMB) banking customers to manage line-item receipts directly from their desktop and mobile banking applications. Customers can capture and store paper and electronic receipts, which can then be accessed and used for returns, exchanges, expenses, taxes and accounting. Sensibill leverages the rich item-level purchase data to deliver additional value to customers such as enhanced personal financial management, reminders for return and warranty expiry dates, and transaction matching. Sensibill's Receipts iOS and Android Software Development Kit (SDK) can be easily embedded into banking applications, providing access to receipt management features. Sensibill also provides RESTful API access for integration requirements that are beyond the mobile banking application. To find out more visit www.getsensibill.com.